This loving resin cat in angel wing memorial statue pays tribute to a sweet companion who’s now napping with the angels … but forever in your heart. 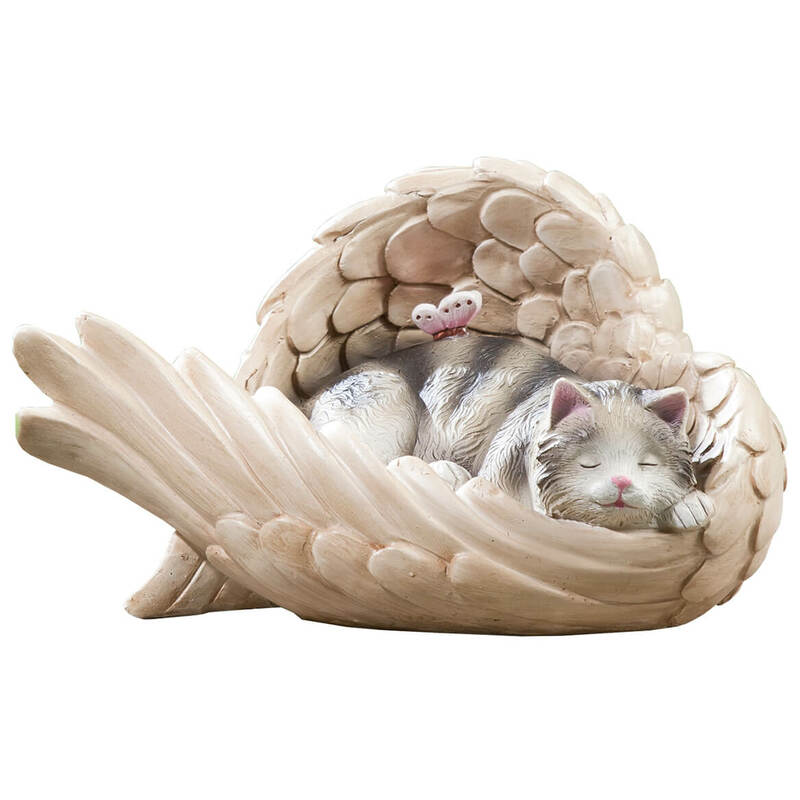 Incredibly detailed all around in weatherproof resin with handpainted charm, the adorable kitty is cozy and content in a heavenly angel wing, as a butterfly friend cuddles close. Whether gracing garden or memorial site, the freestanding memorial statue will comfort your heart—or make a thoughtful gift for a grieving friend. Approx. 9″ long x 8″ wide x 5″ high. This sentimental resin dog in angel wing statue will help you celebrate a precious pup who’s resting with the angels … but living in your heart. 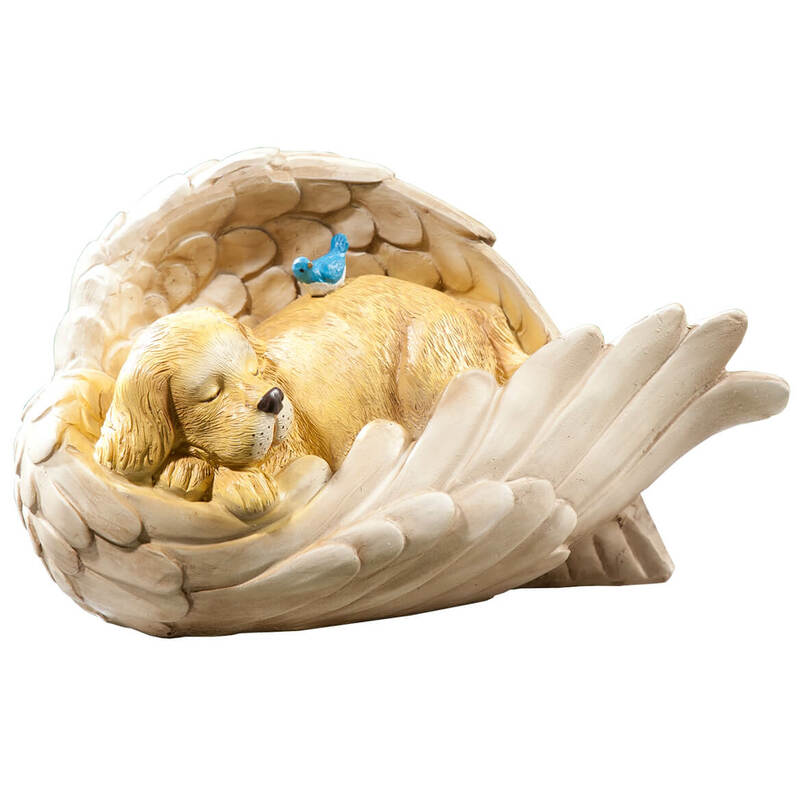 Wonderfully detailed all around in weatherproof resin with handpainted charm, the sweet napping dog memorial is curled up, safe and comfy in a heavenly angel wing, as a cute bluebird friend stands guard. A loving addition to your garden or memorial site, the freestanding memorial statue also makes a comforting gift for a pet-loving friend. Approx. 9″ long x 8″ wide x 5″ high. Gracing your lawn or garden with classic charm, our resin lamb statue is inspired by nature … and sure to inspire smiles each time you admire him. 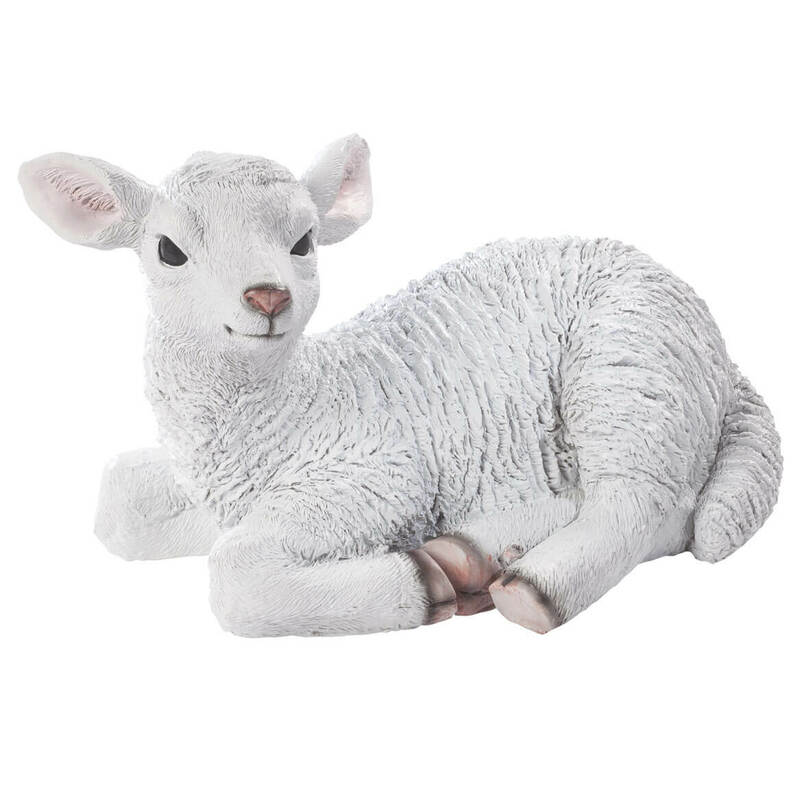 Skilled artisans crafted the exclusive garden statue with realistic detail all around in weatherproof resin—hand painting his white “wool”, perky ears, pink nose and little lamb hooves. Light enough to easily move, yet extremely durable, he’ll be “sitting pretty” for many seasons to come. 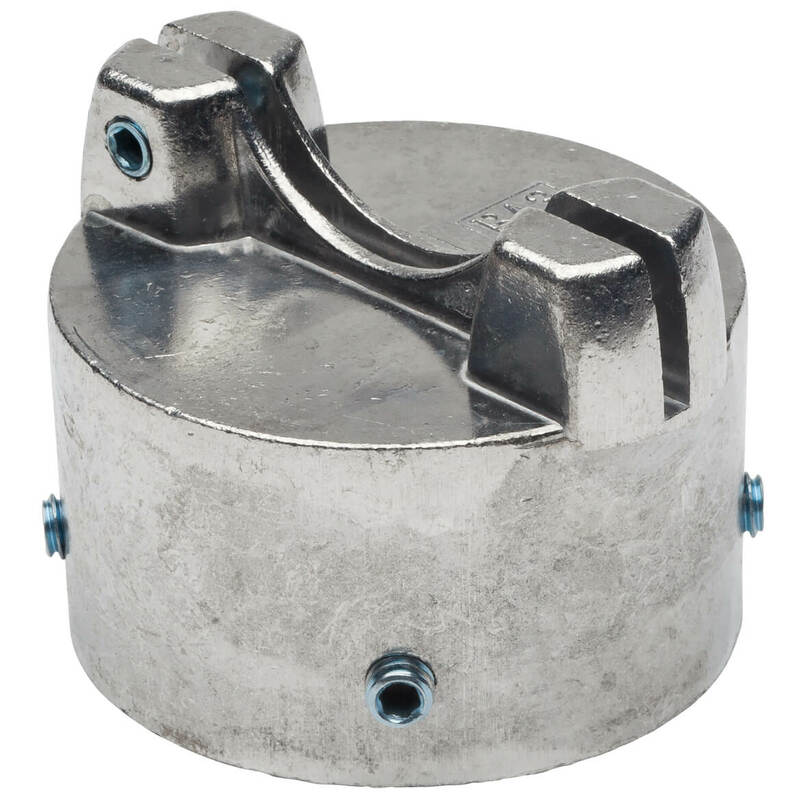 12″ long x 8″ high. 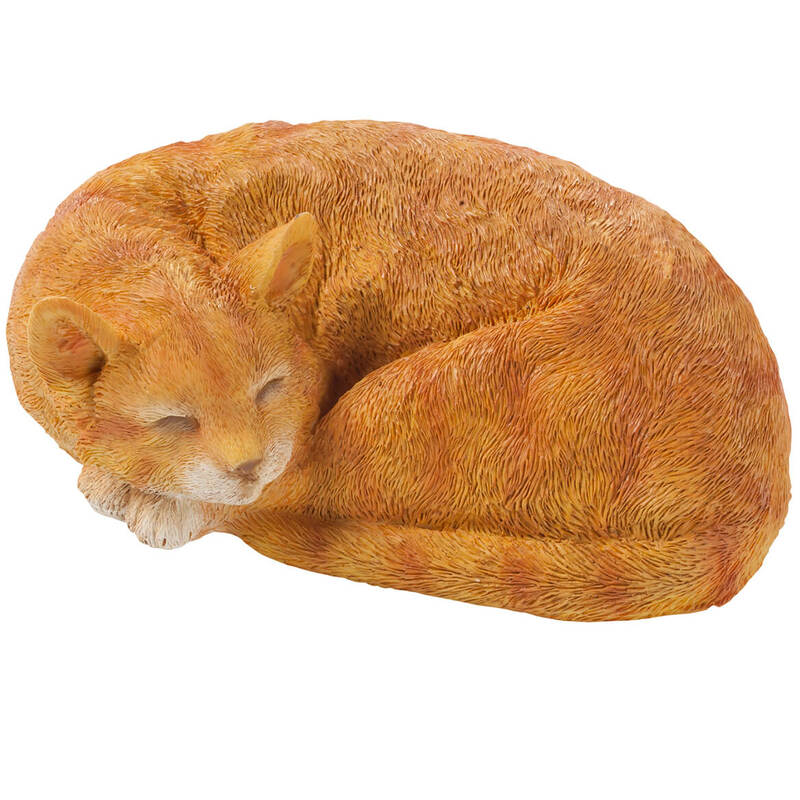 Curled up and napping in sweet feline style, this kitty adds a touch of charm to your lawn, garden, front porch or entryway. Intricately detailed and painted all around, the 3-D statue is crafted of weather-resistant resin for lasting beauty. Just as happy to nap indoors, she’ll add decorative charm wherever displayed! 12″ long x 7 1/2″ wide x 4″ high. Offering bright, lasting beauty with a personal touch, our personalized 12″ daisy garden stepping stone is crafted of weather-resistant 100% cement—personalized for a one-of-a-kind gift. Graced with colorful daisies, it features textured edges for the look of a real stone. 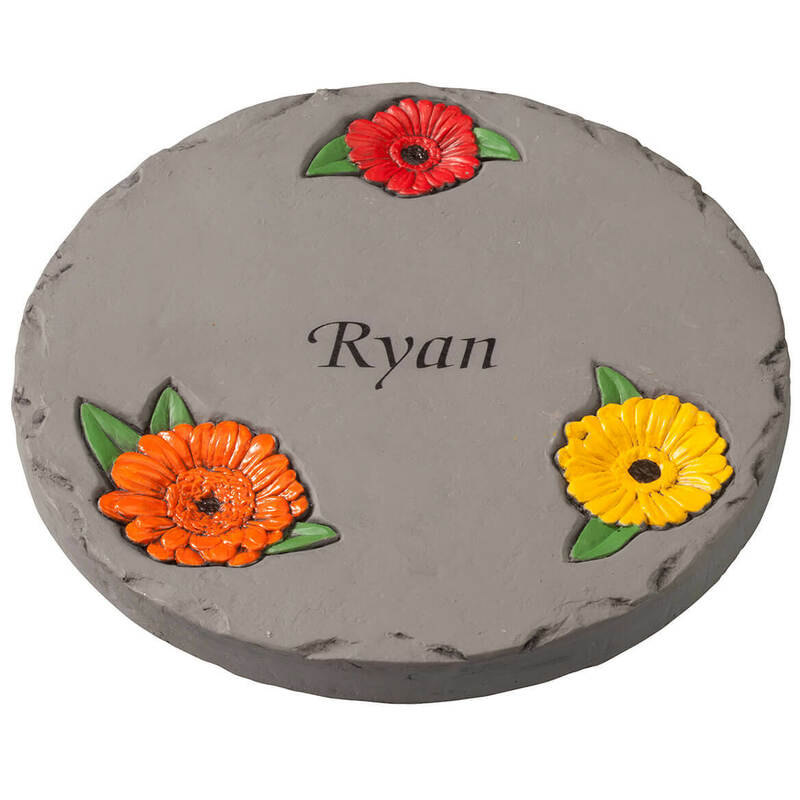 A sentimental gift for any occasion, it’s perfect for Mother’s Day when personalized for Mom or Grandma, and accompanied by our 7″ Daisy Garden Stepping Stone (sold separately), featuring child or grandchild’s name. We’ll personalize our garden stones at no extra cost … creating priceless treasures for any garden. Specify name/message; limit 1 line, 25 letters/spaces. Garden path stone measures 12″ dia. Street sign holder sits atop your street sign pole, gripping your personalized street sign(s). Sign, pole and connector sold separately. Allow 2-3 weeks for delivery. Brightening any garden with lasting style and sentiment, our personalized 7″ daisy garden stepping stone is crafted of durable, all-weather 100% cement. Featuring three colorful daisies, the decorative pathway stone features textured edges for the look of a real stone. 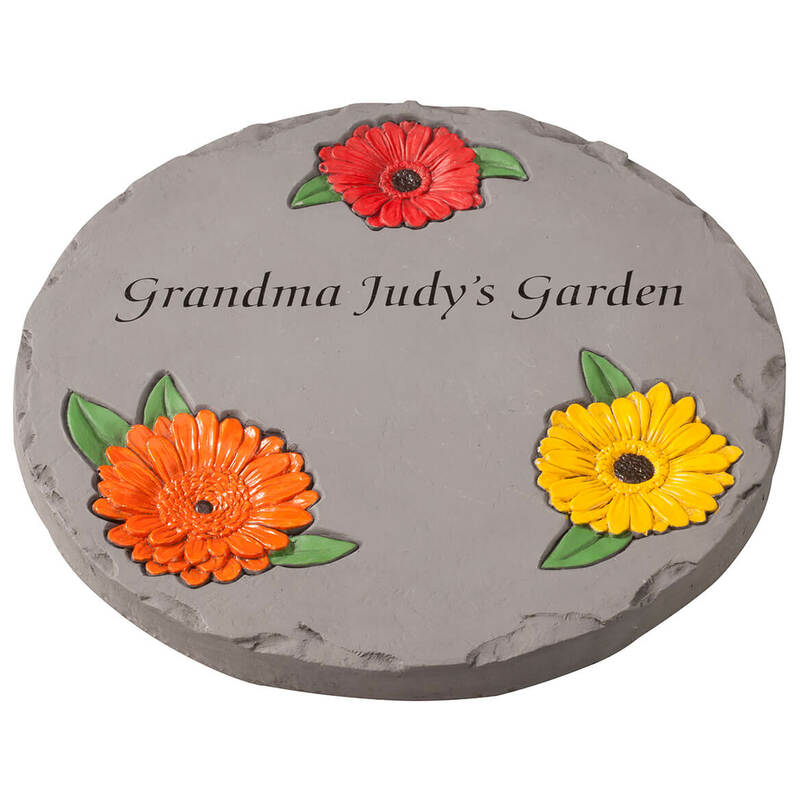 A thoughtful gift for Mother’s Day, birthdays or any occasion … and even more fun when you let us personalize this 7″ garden stone with a child or grandchild’s name, and add Mom or Grandma’s name to the larger 12″ Daisy Garden Stepping Stone (sold separately). We’ll personalize at no extra cost. Specify name/message; limit 1 line, 12 letters/spaces. 7″ dia. Sparkling with clear brilliance in the sunlight, this solar LED color-changing angel stake stores up solar power for a glorious, color-changing glow each night! 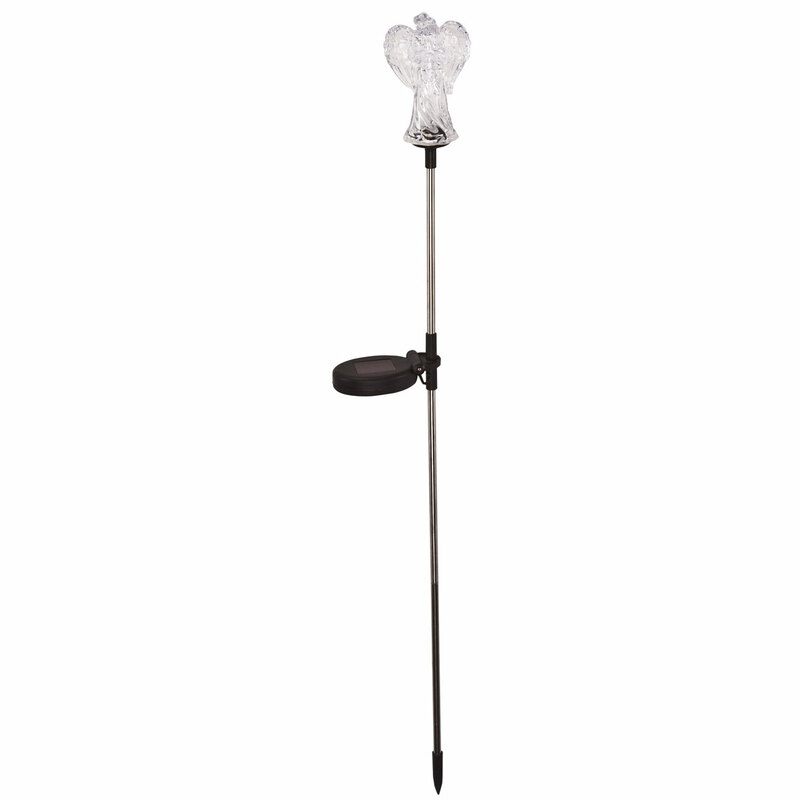 Beautifully detailed all around with the look of clear crystal, our angel’s lawn stake includes a built-in solar panel. When charged in direct sunlight, its battery automatically activates the color-changing LED light at dusk, turning off at dawn. Simply stake it in the sun, and enjoy! Plastic and stainless steel; includes rechargeable AAA battery. Easy assembly. Angel solar light measures 3 1/4″ long x 2 1/4″ wide x 32″ high with stake. 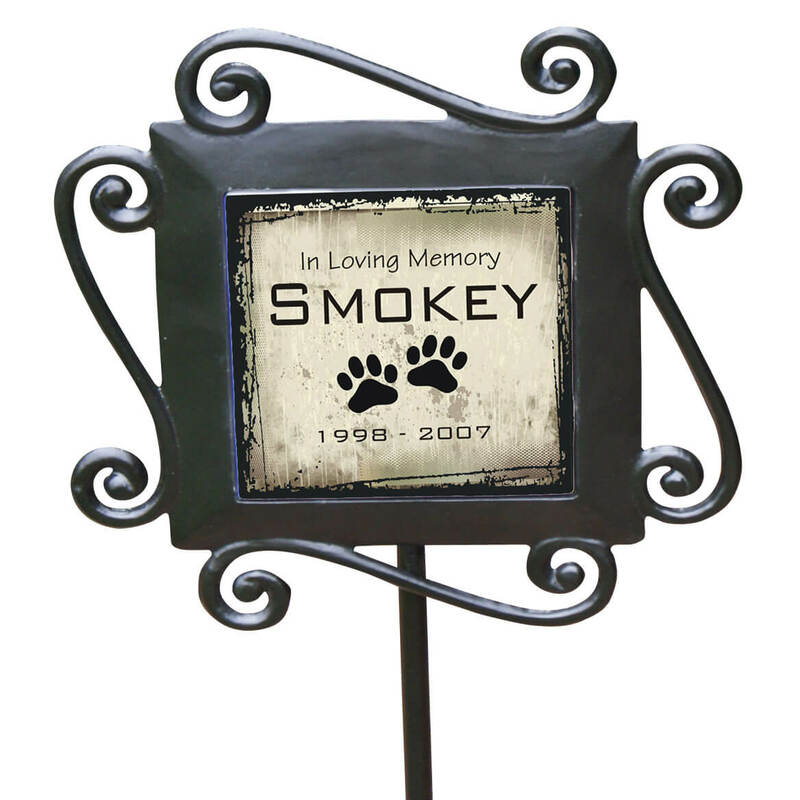 Personalized pet memorial garden stake keeps your pet forever in your heart. Pet memorial garden stake is a charming accent for yard or garden and a fitting way to distinguish a special shade tree, rosebush or memorial site, lending artful sentiment to your landscape. The durable, decorative wrought iron stake’s ceramic tile insert reads, “In Loving Memory”. We’ll personalize with your pet’s name and dates of his or her life. Specify name; limit 1 line, 16 letters/spaces. Specify dates; limit 1 line, 16 characters/spaces. 8 1/2″ wide x 28″ high with 4 1/4″ tile insert. Allow 2-3 weeks for delivery. No express shipping. This beautiful solar LED color-changing cross stake shimmers in the sun—turning heaven’s solar energy into a color-changing glow each night. 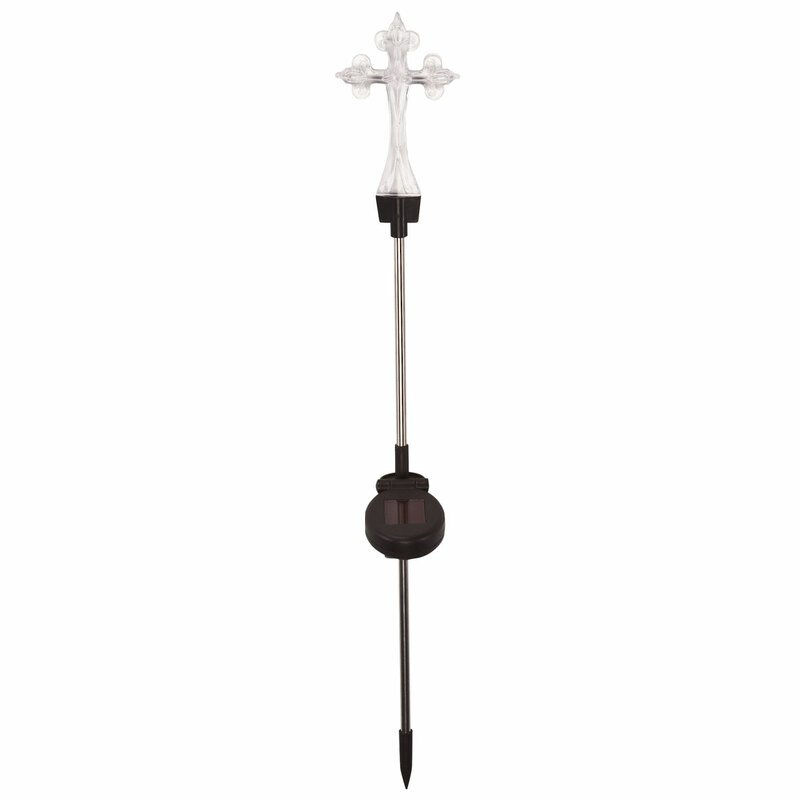 Finely detailed all around with the look of clear crystal, our cross tops a sturdy lawn stake with an integrated solar panel. When charged in direct sunlight, its battery automatically activates the color-changing LED light at dusk, turning off at dawn. Simply stake it in the sun, and enjoy! Plastic and stainless steel; includes rechargeable AAA battery. Easy assembly. Garden stake measures 3 1/4″ long x 2 1/4″ wide x 32″ high with stake.